Wafers to be bonded are loaded on a bond chuck, only separated by 100 µm thick spacers. The wafers can be loaded on the bond chuck in the MA6/BA6 bond aligner, or just placed manually. 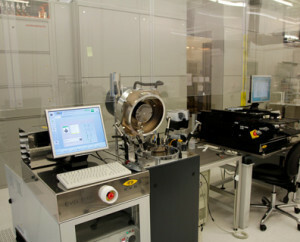 In the bonding chamber the wafers are brought to contact in the centre under controlled atmosphere and temperature, and with controlled force.Wafers for fusion bonding should be compatible by piranha and NH3 (RCA1) clean, and should be compatible with a high temperature anneal of 800 °C-1050 °C. Thermal oxide and pure Si surface only, with roughness less than 5 Å rms. Typical fusion (pre)bonding temperature: 50 °C. Typical temperature for Al-Al thermocompression: 400-550 °C. Maximum force: 60 kN Controlled atmosphere: Vacuum, one gas inlet for an additional process gas.